Sinji Grip is a smartphone holder that is easy to use anywhere and at any time. The greatest focus is on a better grip on your phone and there is no preparation required in order to use Sinji Grip. Just put it in your hand and you are ready to go - simplicity with optimal functionality is one of its biggest advantages. The part of Sinji Grip that serves as a holder is a highly elastic band that easily stretches and always goes back to its original shape after use. The material is also soft to the touch, so it is comfortable to use since it does not irritate the skin. 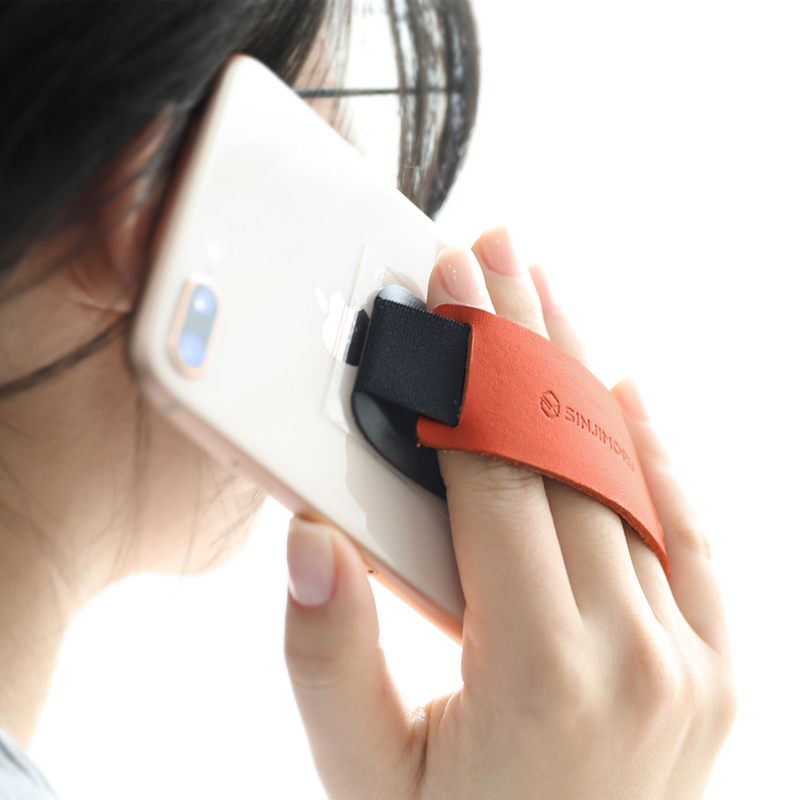 It smoothly fits around your hand and guarantees excellent hold, so that you do not have to worry about accidentally dropping your phone anymore. Made from a highly elastic band paired with non-toxic, premium, natural leather and therefore guarantees high endurance, reliability and a long-lasting use. The sides of the plastic part are rounded in order to avoid any irritation to your skin when you put your hand in the holder. Using your smartphone for a long time may make your wrist hurt - but if you use Sinji Grip your wrist will not get tired and you can hold your phone more comfortably. An additional adhesive film is provided to reinforce the adhesiveness of the product. 1. Remove the protective paper from the 3M tape that is on the back of the Sinji Grip. 2. 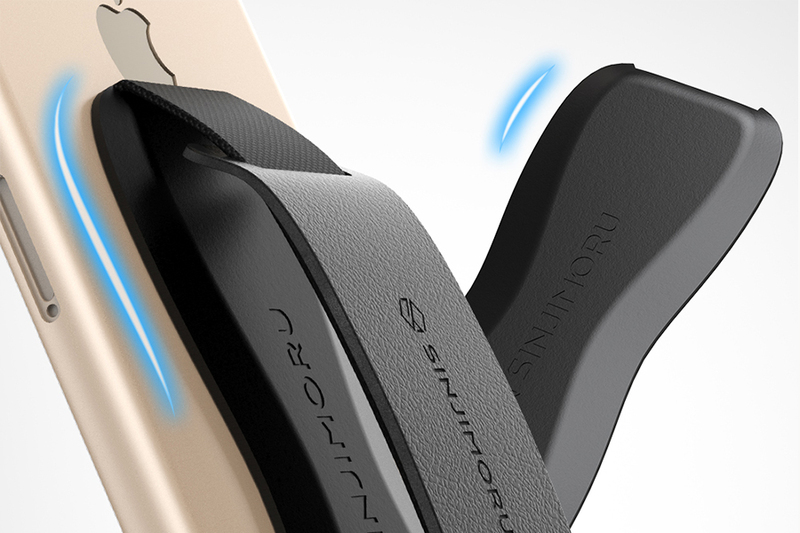 Attach Sinji Grip to the back of your smartphone and you are ready to go. 1. Remove the protective sheet from the additional adhesive film. 2. Attach the additional adhesive film to the back of your phone. 3. Attach Sinji Grip on top of the additional adhesive film. 1. Push the leather part of Sinji Grip together to form an arch. 2. 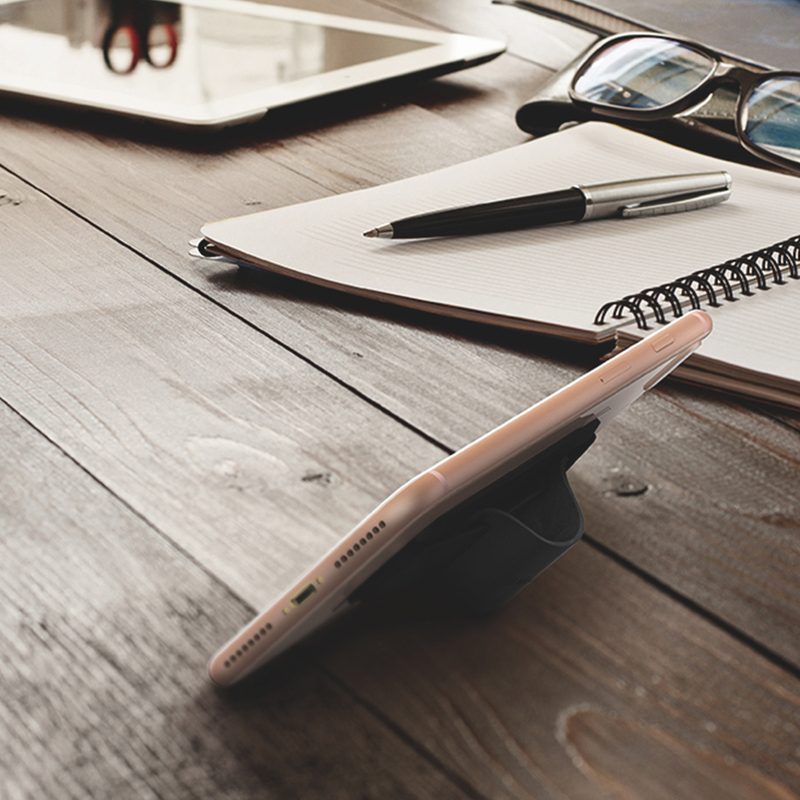 If you put Sinji Grip on the table like that it will work as a phone stand. The included 3M tape will (after being attached) reach 50% of its full adhesive strength approx. after 20 minutes, 90% after 24 hours and 100% after 72 hours at room temperature. The 3M double-sided tape offers a strong adhesion that cannot be reused. If the back of your smartphone is made out of glass (e.g. 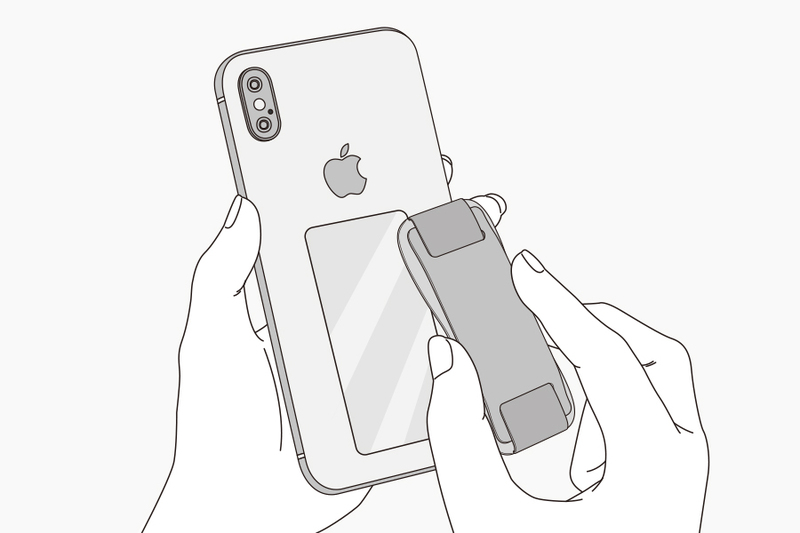 iPhone X and Galaxy S9), or if it is curved, or if you are using a case made out of leather or other rough material, please attach the additional adhesive film first to strengthen adhesiveness. Wireless charging might be constricted.